Our recently-completed vacation house is situated on our olive farm in Paso Robles, California. The Olive House is nestled in a hillside with 360 degree views of open skies, rolling hills, olive trees, and grape vines. It is designed for comfort and relaxation, with two beautifully appointed master suites, three fireplaces, full kitchen, private terraces for morning coffee, and a stunning flagstone courtyard featuring a tiled fountain. The scent of lavender, rosemary, lemons and sage fills the air. It is near dozens of vineyards, wineries, walking trails, and the charming town of Paso Robles. 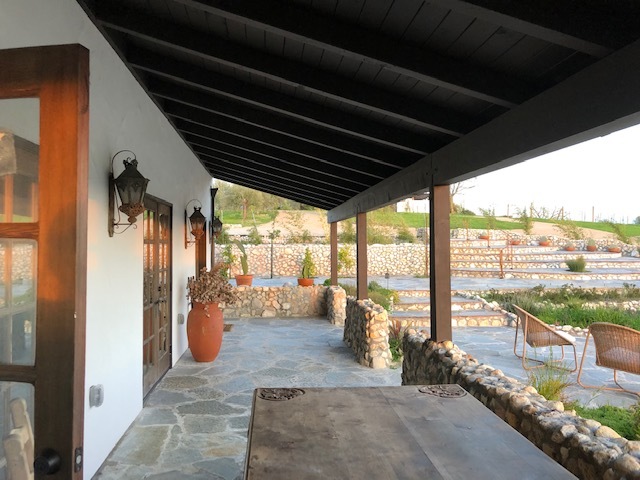 The Olive House is close to the wonderful shops and restaurants in the historic town of Paso Robles, but situated on a quiet lane with stupendous views of vineyards and olive groves. Beautifully decorated, it is comfortable and private – a perfect base for both relaxing and for exploration. With panoramic views of the surrounding hills and vineyards, The Olive House is only 15 minutes to downtown Paso Robles. Still Waters Vineyards, with its gorgeous gardens, picnic areas and top-notch wines, is just down the road, and Cass Vineyard and Winery, the 2018 Central Coast Winery of the Year, is also nearby. The sunsets are magnificent! Paso Robles is an historic and picturesque town, with superb restaurants and shops situated around its grassy square. A year-round farmers market, summer concerts, and over 250 local vineyards are yours to enjoy. Hiking trails, cycling routes, and paved walking paths are plentiful. Three California Missions are within a short drive (Mission San Miguel Arcángel, Mission San Antonio de Padua and Mission San Luis Obispo de Tolosa), as are the beachside town of Morro Bay and the colorful city of San Luis Obispo. Guests will have use of the two-bedroom, two-bath home, which features indoor and outdoor dining areas, a washer/dryer, and both shaded and sun-drenched terraces. Reservations for The Olive House can be made through AirBnB, or by contacting us directly.